In Georgia, inside the Gwinnett County jail. Atlanta – Gwinnett County Sheriff Butch Conway and Lt. Col. Carl Sims currently face a federal lawsuit in response to widespread abuse of inmates. Plaintiffs are 75 current and former inmates whose testimonies have revealed systematic cruelty at the county jail. Central to the lawsuit are restraint chairs used to strap down inmates’ hands, feet and heads. In one instance, guards strapped down a military veteran with PTSD after also stripping him of his clothes. Similar brutality has been meted out to several other inmates with physical and mental disabilities. Such inhumane tactics are used by the jail’s “Rapid Response Team,” which receives orders and direction from the police officers charged. 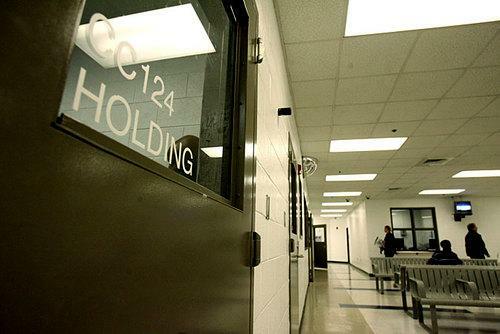 According to one of the attorneys filing the suit on behalf of current and former inmates, video evidence shows that there is often no apparent reason for many of the team’s violent assaults. Guards can be seen in some cases entering cells using “nonlethal” SWAT tactics on noncombative victims — many of whom are then strapped down for hours. Created in 2008, the Rapid Response Team has a long-established record of unwarranted and excessive force. The current lawsuit was preceded by a similar suit by other inmates in 2015 — the case is still pending. The jail illustrates perfectly how the prison system, which functions as an apparatus of class rule and white supremacy, both exacerbates and criminalizes mental health conditions in working-class people subjected to its tortures.